With PREDATOR der-materialspezialist developed a long pimple rubber which has only one target: HUNT and FEET! PREDATOR hunt with his long ripper tooth every kind of spin and eat the attacking efforts of his reval. His genetic code offer an perfect row of thees whith a special synchronized surface. This singular condition permitted PREDATOR a powerfull counter attack by every passiv behaviour of his prey.But the PREDATOR can also act slow and controlled. Lurking to the perfect moment he is back to punish his disputant with ugly curl effects and incalculable swirling balls. 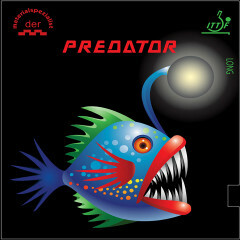 Der Materialspezialist Rubber Predator is beeing added to cart.